We thought that walking was one of the biggest advantages of being humans, but you know what, that doesn’t mean it can’t be improved upon, and some bright spark has done just that by automating the walking process. 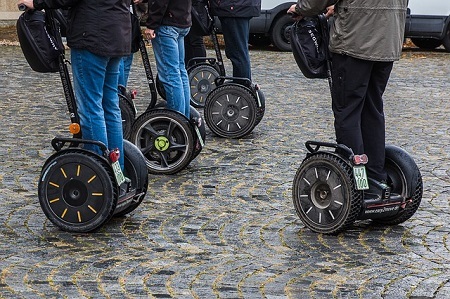 With the segway, we can now traverse the pavements where transport would once have been forbidden, save our legs from aching and our feet from swelling, and still see all of the sites. With a top speed of 12.5 miles per hour, you won’t exactly be living life in the fast lane if you buy a segway, but you will get where you’re going way faster than if you walked! The only real drawback is, that like the Daleks of old you might find stairs to be a bit of a challenge! If you’re weighing up the moped vs motor scooter debate right now, let me throw a spanner into the works by bringing to your attention the trike scooter. Okay, not really, the Trikke scooter would hardly compete with the power and convenience of those distinctly much more grown up modes of transport, but it would arguably be more fun! The Trikke, which can be purchased for just $199 is a hybrid of sorts of a scooter and skate. Unlike traditional scooters, it has two wheels at the back. These can be swung in and out, causing the Trikke to move forward. It’s pretty slow, but it’s also great fun, and you can kind of get a good workout when you ride it too! The Velomobile is not exactly cheap at around $4000 but is another fun-filled form of transport that is sure to turn heads. 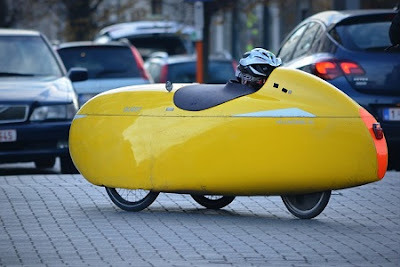 The best way of describing it is probably to say that it is a three-wheeled pushbike inside a plastic outer shell. Where it has an obvious advantage over your average pushbike is that the plastic covering keeps the elements out, but you will surely get a lot of odd looks if you head to the store in it! The Poweriser A Poweriser looks like something that a superhero would use to get around in the comic books of old. IOt uses a brilliant system of stilts that are spring-loaded to superpower your feeble human legs and run and jump at speeds only the superhuman could achieve. And for less than $200, who wouldn’t want such a device? The magic wheel is like a whacky and wonderful amalgamation of roller blades, unicycles, and your favorite teenage skateboard. With one large and one small wheel, it’s a tiny device, which you can easily pack in your bag or briefcase, pulling out only when you need to get somewhere in a hurry. You might want to work on your balance before you give it a whirl though! The treadmill bicycle consists of a treadmill platform that is positioned across a normal bicycle frame at a slight incline. It is also connected to the back wheel of the bike. To operate it and start moving along, you must either walk or run on the platform, thus turning the back wheel and propelling yourself forward. Somehow, I can’t see it replacing the common two-wheeled bike we’ve all been perfectly happy with for hundreds of years now, but you never know! Hovercrafts were once our dream for the future of transport, well we were more interested in hoverboards really, but you take what you can get! They have been around for quite some time now, but the devices, which are typically constructed from fiberglass, rubber, and vinyl, and which use gas and air to propel themselves along seemingly off the ground, are still a pretty fun way to get around if you’re not in a hurry or you don’t, y’know need to go on the freeway. The Hot Rod Recliner is Homer Simpson’s dream come true. It is a comfy leather recliner that has been fully kitted out with four wheels, a chassis, a suped-up lawn mower engine and even a stereo system, amongst other things. It was created by a man called Dennis LeRoy, who basically pimped his La-Z-Boy and made it the super cool dream of couch potatoes everywhere, and it is surely one of the coolest ways to get around of all time! Unfortunately, you can’t buy it commercially, but maybe you could make an armchair car of your own! The AquaSkipper, which can be purchased for around $500 is an exciting and fun-filled way to travel on water. 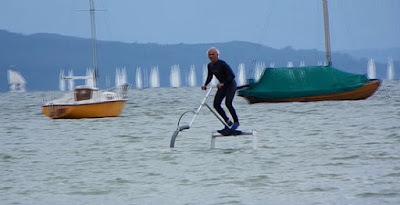 I mean, who needs yachts or cruise ships, let alone jet skis, when you can have what is basically a hydrofoil powered by your own body which allows you to hop your way around? The Aquaskipper is attached to a two separate sets of fins, and as you jump up and down on its platform, these are activated, performing a side to side motion, which allows you to make your way through the water much like a dolphin or shark would! I’m not sure it beats the cruise ship actually! I mean what would happen if you run out of steam half-way towards that beautiful desert island you’ve been dreaming of? Okay, so most of us would probably rather stick with the car, or even the humble bicycle, than travel via these downright kooky means, but at least they’re interesting, and it’s kinda good to know that there are still some eccentrics out there creating innovative if not exactly practical designs!